Located near the heart of Mexico City’s historic centre, the market is the manifestation of an ancient belief in the power of magic that persists to the very core of Mexican culture. A young woman with long, jet black hair looks patiently out from between her strange wares. Stacked high behind her a rainbow of promises wait in bottles for desperate customers. She nods and beckons to passersby as their eyes roam over her votive candles and potions, imagining for a second what they could do with perfect health, great riches and irresistible charms. Her mystic stall is just one of hundreds, if not thousands packed tightly together filling a huge warehouse and spilling out into the surrounding area under colourful plastic tarpaulins. Mercado Sonora, also known as the witch market, is renowned for its sale of herbal medicines, enchanted talismans and live animals. The market was set up in the 50s and continues to be as popular today with locals looking to white or black magic for solutions to their problems, as it is with curious tourists. Located near the heart of Mexico City’s historic centre, the market is the manifestation of an ancient belief in the power of magic that persists to the very core of Mexican culture. Hidden among the traditional herbs and tinctures that have been passed down many generations, can be found more controversial remedies; rattlesnake skins to cure cancer, dried skunk to strengthen the blood, and hummingbirds to tempt love through your door. In the darkest depths of the smoky, esoteric labyrinth, shamanistic services are offered by the mystic traditions of Santería, Santa Muerte (holy death) and Sufism. Partially concealed by a velvet drape, a wrinkled face with thin pencilled eyebrows and claw-like, fake nails shuffles a deck of tarot cards. A quiet queue nearby awaits a tantalising glimpse into their future. Other mystics offer purifications for the body and soul, expulsions of bad luck and bad energy, and contact with the spirits. 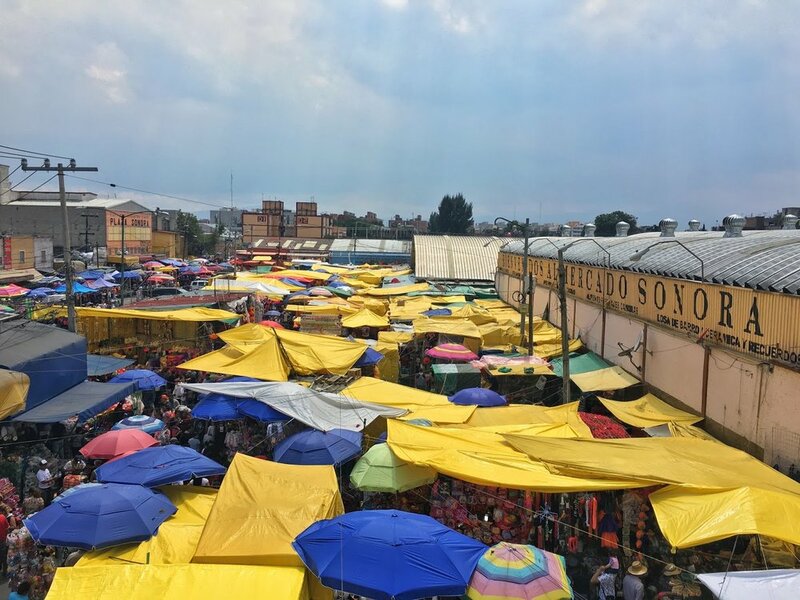 Mercado Sonora is just one place for the spiritual to tend to their supernatural needs. All across Mexico, occult rituals are undertaken in locations believed to be energetically charged, weakening the border between this world and the arcane. To experience it is to believe it.